Last time we covered where to find good furniture, so today I’m going to outline a few things I look for when picking it out. I learned the hard way that there are quite a few things to check out on a piece of furniture before you hand over your hard earned cash. 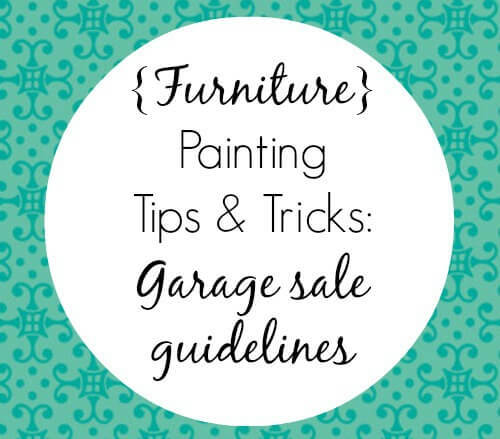 We’re going to call these garage sale guidelines. 1. Make sure what you’re buying is made of solid wood. This can actually be tricky at first, especially if you’re not used to checking. It’s kind of embarrassing, but I hadn’t give much thought to the poor quality of laminated, particle board furniture before I started painting. I kind of just assumed all furniture was created equal. Not true. Even some nice, solid wood pieces have veneer on them. This is similar to laminate in that it chips off, but you can usually fill it in then paint over it if you need to. Laminate and particle board is a deal breaker. If a piece is old and interesting, I’ll usually let veneer slide since you can typically sand down the veneer to get rid of marks from previous use since it’s made of real wood. 2. Take out and examine every drawer. Even if a drawer seems to slide well, sometimes when you take it out you’ll discover that it’s been broken before and wasn’t put back together properly. Most drawers can be fixed with some wood glue, but it can be a frustrating and time consuming process. You’ll most likely need a few clamps in order to fix them. Also, check for dove tailed drawers. This is where the joints are interlocked like this. This style of drawer often holds up better and is easily fixable if broken. Most quality antique furniture has dove tailed drawers. Older furniture usually has wooden or metal sliders to help the drawer glide into the piece of furniture. The metal ones can easily be nailed back in place, but sometimes a missing piece of a wooden one can cause you some trouble. We personally don’t have all the saws required to cut new pieces, so I try to avoid any drawers with sliding problems. If you do find that your drawers are broken, the internet is full of ways to fix them. It just depends on how much time you’re willing to invest in your piece. 3. Check the piece from all angles. Sometimes I’m so excited to find a piece of furniture that I don’t notice all the imperfections at first. I usually notice them as I unload the piece into my garage. Check to make sure the bottom doesn’t have water damage (especially if you’re shopping out of someone’s garage/basement). Check for marks in the wood and make sure you can easily sand them all out for a smooth finish. Make sure the legs aren’t too wobbly or can easily be tightened. Stand back and assess whether or not the wood is straight or could possibly be sagging (this could make easier repairs a little more difficult). Check for big chunks of wood missing. You would think they’d be obvious, but sometimes when they’re on the edge of a drawer or something, I miss them. Imperfections aren’t always a deal breaker though. A little chip here and there can provide character. 4. Consider the amount of work it will take to make it nice. A few times, I’ve wanted to kick myself for buying some really chippy pieces of furniture. Chippy can be really nice if you want to seal it in and leave it that way, but sanding off layers and layers of paint that have been applied over the years can really be hard work. I have easily put in over 10 hours trying to sand down a dresser before. I try to avoid these types of pieces if at all possible, but sometimes a piece has such a pretty shape that I decide it’s worth the extra effort to make it look nice. 5. Don’t overpay for your furniture. For me, part of the point of scouring garage sales and estate sales for furniture is to find a good deal. Now that painting furniture has become really popular, it’s harder to find the good deals, but they are out there. The price of furniture varies depending on the area, but I set a budget for myself and won’t buy anything that costs more than that. My personal top dollar is $50…and I only buy really nice old furniture at that price. For a more modern piece or something that requires some work, I typically try to stay around $30 or less. I read once that if you can’t fix it up and sell it for 3 times the price you paid for it, then it isn’t worth your time. However, if you’re just looking for furniture for yourself and you have something specific in mind, you might be willing to pay a little more for it. And always, ALWAYS try to get it for a lower price. Garage sale furniture is always up for negotiation. Especially if you’re there towards the end of the day, most people will give you a good deal just to get rid of it. Any questions about my garage sale tips? And what are yours? What do you look for when buying used furniture? Thanks for sharing these useful tips. I agree, it is tricky to determine the quality of wood. Whenever I buy furniture I always inspect drawers in cabinets, sit in chairs and lean on tables to make sure it is still in satisfactory shape. That’s definitely a good idea! Even though I know these rules, sometimes I get home and find problems I wasn’t expecting. I just go a buffet from a family member who no longer wanted it. It is straight out of the early 70s and needs some softening/updating. Replacing the knobs and painting will do most of the work but, there are small drawers at the top on each end and they have a line carved into them with a knob above and a knob below – to make it look like its two drawers. I want to fill in this carved line with wood filler. Have you ever tried anything like that? Any hints you can offer? Thanks in advance for any advice you can offer. I enjoyed your blog. I have not done that but it seems like it should work. Just make sure you have it sanded completely even before painting, or the line will be visible. Good luck!